Apple introduced a Retina Display version of its 13.3-inch MacBook Pro on Tuesday during its special media event in San Jose, California. Like its 15-inch big brother, the 13.3-inch model drops traditional spinning hard drives in favor of flash-based storage. The 13-inch Retina MacBook Pro ships with an Intel dual-core 15 or i7 processor, Intel HD Graphics 4000, 8GB RAM, up to 768GB RAM, dual Thunderbolt ports, USB 3, and up to seven hours of battery life. 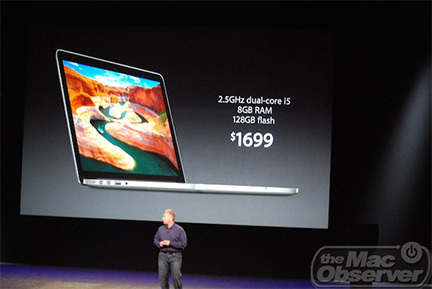 It's 20 percent thinner than the previous 13-inch model, and weighs just 3.5 pounds. The 13.3-inch Retina Display sports a 2560x1600 resolution with 4,096,000 pixels -- which, according to Apple's Phil Schiller, makes it the second highest resolution notebook display behind the 15-inch MacBook Pro. Pricing for the 13.3-inch Retina MacBook Pro starts at US$1,699 for the 2.5GHz dual core i5 model with 8GB RAM and 128GB flash-based storage.